This post is part of 3 week series giving current and aspiring game devs the tools, resources, and advice they need to get started building for Windows. 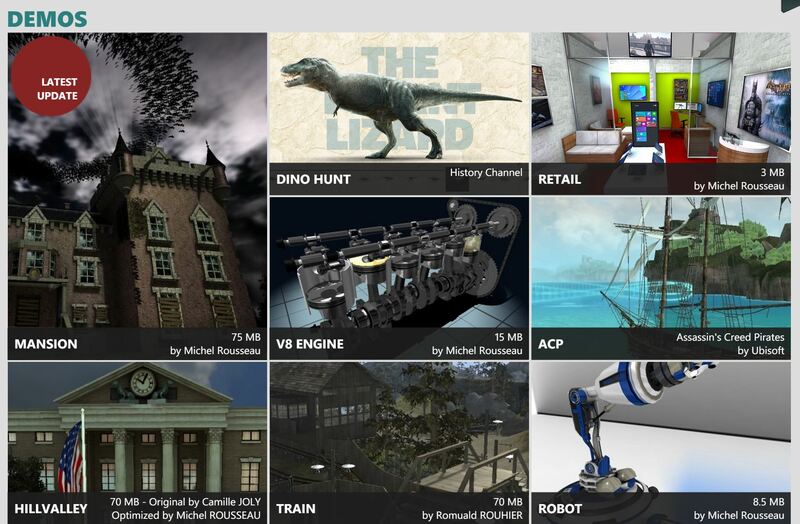 We also have a great video course on game production basics at Microsoft Virtual Academy. You need an IDE, or Integrated Development Environment, to write code for your games. Visual Studio Community edition is FREE from Microsoft, and allows you to use a multitude of languages. There is even a plugin that allows you to debug Unity applications from within Visual Studio. MonoGame is an Open Source implementation of the Microsoft XNA 4 Framework. MonoGame allows XNA . It currently supports Mac OS, Linux, iOS, Android, Playstation 4, and the OUYA console. Two higher profile titles include Bastion, Skulls of the Shogun, and Fez. At GDC 2015, Microsoft showed it off on Windows 10. Bob Familiar recently wrote a 3 part blog series on MonoGame that takes you step by step through the process from getting your development environment setup to getting your game Windows 8 Store Ready. Similar to MonoGame, SunBurn is an abstraction of XNA 4, which allows developers to easily target multiple platforms. A free version is available, but if you want to use the editor to do things like drag-and-drop 3D models onto a scene, then you’ll need to pay for the premium versions, which are priced well. At the moment SunBurn supports Windows, Win8, Win Phone 8, Xbox 360, OSX, and Android, although more platforms are in the works. Who said drag-and-drop was dead? GameMaker proves that you can still make commercially viable games, without needing to use AAA engines and knowing how the ins-and-outs of memory management in the latest programming language. Often seen as a prototyping tool, GameMaker is responsible for some big hits in recent years, and more on the way, including: Hot Line Miami, Nighogg, and Death Ray Manta. A free version is available, but you’ll need to pony up a few bucks for additional platforms. Keep an eye out on Steam as well, as they frequently have flash sales for the framework. I managed to nap a professional license for $100 not too long ago! It can be overwhelming when you are starting off, because there are so many options available to you. I mean just look at plethora of game making tools at Pixel Prospetor, and you’ll see what I’m talking about. If you have zero programming experience, then I’d suggest starting with Construct2. 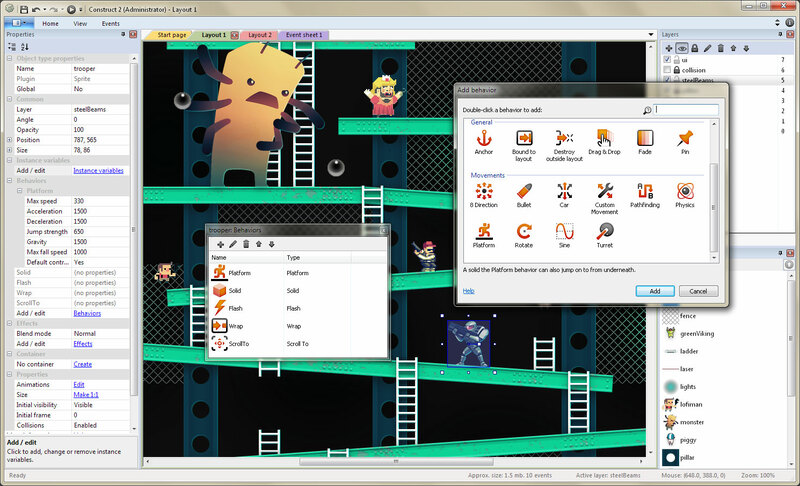 Construct 2 allows you to create HTML5 games without ever having to write code. Everything is handled in the IDE (Integrated Development Environment) which has a GUI (Graphical User Interface) that anyone could use. You simply drag-and-drop objects into your scene, and can make changes to the objects properties by right clicking. Even better, it’s free! There are premium versions available, but if you’re just starting off, then the free version offers more than enough to get you going. Fresh off of the Game Developers Conference, Epic revealed that their newest engine would be made available to everyone immediately, for free. This is a big change from the previous licensing agreement of UDK. A complete revamp of the UI has taken place, in addition to a new visual scripting system called “Blueprints”. Gone are the days of UnrealScript as well, as of the engine’s programming is now done in C++. Even better: the entire source code for the engine is available for free. The editor works on Mac and PC and projects can be deployed for Windows, OSX, iOS, and Android, in addition to the PS4 and Xbox One. UDK makes use of its own programming language, called UnrealScript, which may throw some new developers through a loop. The language was designed for simple, high-level programming langage. The UnrealScript interpreter was programmed byTim Sweeney, who continues to develop the newest version of the engine, Unreal Engine 4. Similar to Java, UnrealScript is object-oriented without multiple inheritance (classes all inherit from a common Object class), and classes are defined in individual files named for the class they define. This author just happens to have written a book about how to program for this engine. Many of last generation’s most popular titles used this engine, including Gears of War, Mass Effect, and Bioshock. WebGL allows your web browser to talk to the GPU on your device, whether it is a desktop machine or a phone. Writing low level code to allow for this interaction can be a bit of a barrier to some, so several engineers from Microsoft have created the free and open source framework, BabylonJS. Not to be out done by Epic at GDC, Crytek announced that their latest engine is no available to everyone for a measly $10 / month. This engine has powered some of the most beautiful games on the market, including the Crysis series, and Ryse: Son of Rome on Xbox One. A bevvy of new features recently announced include Physically Based Shading, Geometry Cache and Image Based Lighting. All programmig is done in C++ and Lua for scripting. 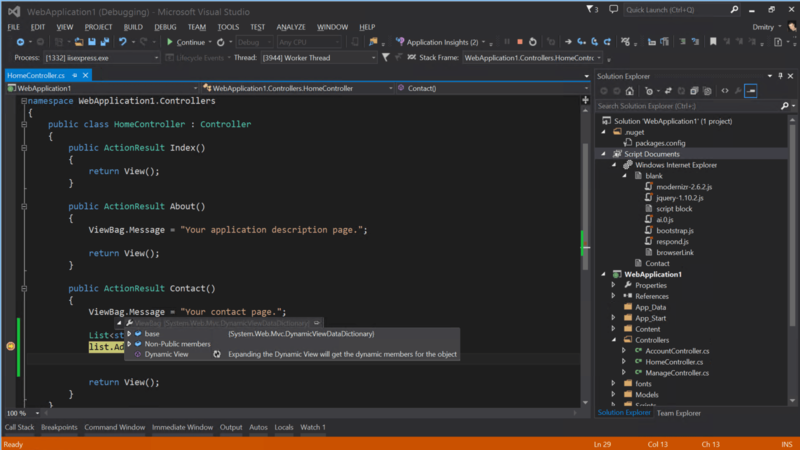 However, there is currently a tool in the works for C# developers, called CryMono. One large benefit in Maya’s corner however, is the fact that it works on both PCs and Macs. Due to Autodesk’s acquisition of Maya in 2005, the differences between Maya and Max have begun to converge, so it’s largely a matter of personal preference at this point. While the differences are subtle, larger studios tend to stick with one tool or the other. At Unite 2013, Unity’s annual gaming conference, Maya announced that they are now releasing a lighter version of Maya for indies called MayaLT, which can be purchased using a variety of subscription models. Prices start at $50 / month, and is perfect for those looking for a short term licencing model. 3DS Max is perhaps slightly more popular in the gaming industry, but you shouldn’t have a problem finding a job if you know Maya either. The hotkeys are very different and the viewports may throw users off when coming from one tool to the other, but they largely perform the same tasks. Many game engines feature workflows for easy exporting from MAX to the particular engine, so look carefully before making your decision about what to purchase, and gauge the value of the tool from there. Alternatively, Blender is an open source and free 3D modeling tool, but not nearly as featured as either of Autodesks offerings. Considering that most professionals use the two tools listed above, I’d suggest skipping over Blender completely. In terms of audio tools, Adobe Audition, along with Avid Pro Tools, are the defacto standard. You can now purchase it as part of Adobe’s Creative Cloud suite, which include Photoshop, Illustrator, and other image editing tools. Alternatively, Audacity is a free audio editing tool which works for those of us on a cheaper budget. Even if you weren’t using this for soundtracks or sound effects for games, it makes for an excellent tool for creating and editing podcasts, which are invaluable when it comes to promoting your work. great article. everything in one place. makes me want to dive in and write a game.